This policy describes the safe handling requirements for persons who work with cryogens or operate cryogenic-liquid-handling systems at Lawrence Berkeley National Laboratory (LBNL). This document is not a substitute for On-the-Job Training (OJT). A cryogen or cryogenic liquid is defined by the National Institute for Standards and Technology (NIST) as any liquid with a boiling point below 93K (-180°C or -240°F) at 1 atmosphere of pressure. This definition includes liquid nitrogen, liquid argon, liquid helium, liquid hydrogen, and liquid oxygen, among others. This definition does not include, and this policy does not cover, liquid propane, liquid butane, liquid acetylene, or liquefied natural gas (methane). This document addresses cryogenic safety with a primary focus on and specific examples of the inert cryogenic liquids of liquid nitrogen, liquid helium, and liquid argon. Liquid helium, liquid hydrogen and liquid oxygen present additional hazards above liquid nitrogen and liquid argon. For more information on liquid helium, liquid hydrogen and liquid oxygen, see Appendices B, C and D, respectively. NOTE: Liquid nitrogen is the most frequently used cryogen at LBNL. Be aware of the hazards related to the equipment. Know the methods for controlling those hazards. Follow the proper operating procedures applicable to the equipment. Work under an approved activity in the Work Planning and Control System. Receive on-the-job training from the Activity Lead for that activity. A thorough evaluation of the safety of a cryogenic application may require a joint effort involving the Environment, Health & Safety (EHS) Division (Safety Engineering and the EHS Research Support Team) and the Facilities Division (Transportation and Rigging Groups). Oversees the Laboratory’s bulk cryogenic systems and their safe design, operation, and maintenance. Preventive Maintenance is conducted on all bulk systems in accordance with manufacturers’ specifications. Ensures that no Laboratory personnel other than Facilities employees authorize or perform maintenance or modification on Facilities-owned bulk systems or to the Facilities-owned portion of a system. For assistance with cryogenic system repairs, maintenance, and modifications, contact Facilities Divison’s Mike Botello at (510) 486-7941 or [email protected]. Is responsible for development, approval, revision and administration of this policy and its implementing documents. Forward suggestions for improvement to Alyssa Brand at (510) 486-7246 or to [email protected]. Ensure that persons within their areas of responsibility comply with this policy and its implementing documents. LBNL staff and affiliates use only equipment intended for cryogenic service during activities involving cryogens. Commercial equipment is not modified in a fashion that could undermine the designed safety features of the equipment or otherwise create an unforeseen hazard, such as inadequate venting of cryogen spaces. All vessel or piping systems containing cryogenic liquids must have adequate pressure relief. Piping and connections for pressurized cryogenic-liquid handling systems are constructed of safe materials and maintained in leak-free, good condition, including dewars, flex lines, tubing, valves, fittings, brazed joints, transfer equipment, and pressure-relief valves. Failures involving these components could result in exposure of personnel to pressurized sprays of the cryogenic liquid. Pressure relief is provided for any piping segment that has the potential to trap cryogenic liquids (i.e., cryogenic liquid trapped between closed valves). Pressure relief is provided for any sections of a dewar containing cryogenic liquids. Pressure relief is provided in vacuum-insulation spaces to address potential leakage of cryogenic liquids into the vacuum space. Personal Protective Equipment (PPE) is available for workers. Ensure that LBNL staff and affiliates complete the required training identified below before performing the indicated work activity or fulfilling the indicated role. Follow all guidance provided in training and Work Processes to safely use, transport, and dispose of cryogenic liquids. For assistance with cryogenic-liquid applications - including safety engineering and laboratory safety - LBNL staff and affiliates should contact the appropriate Division ES&H and Facilities Team representative. LBNL’s EHS subject matter expert for cryogens, Alyssa Brand, can be reached at (510) 486-7246 or [email protected]. Evacuate and not enter the area when oxygen monitors indicate a lack of oxygen. Notify personnel in surrounding areas who may be affected. Seek medical attention for any injuries or cryogenic burns. Report the event to their work lead, supervisor or the LBNL emergency number (510) 486-7911 or 911. For off-site locations (e.g., Potter, JBEI, JGI, etc. ), use the local emergency number. The risk of death due to low oxygen concentration caused by the expansion of cryogenic gas into a limited space, displacing oxygen. Localized damage to skin and tissue due to contact with cryogenic liquids or materials, or even gases cooled to cryogenic temperatures. Any liquid with a boiling point below 93K (-180°C or -240°F) at 1 atm pressure. This includes, but is not limited to, liquid nitrogen, liquid helium, liquid oxygen and liquid argon. A pressurized double-walled vessel, evacuated between the walls, that allows for the pressurized storage of cryogenic liquids for weeks or months. Either liquid cryogen or the gas phase may be extracted from a cryogenic liquid cylinder. A double-walled vessel, evacuated between the walls, that provides thermal insulation to store liquid cryogens for days at a time. Dewars have loose fitting or vented caps to allow for escape of gas as the cryogenic liquid evaporates. A double-walled vacuum vessel with an open top. A loose fitting foam lid may be provided to reduce evaporation rate. These flasks are intended for the open use of liquid cryogen and not for storage. A double-walled vacuum vessel that contains an absorbent material capable of absorbing liquid cryogen and an internal space for racks of samples that is capable of maintaining cryogenic temperatures of the samples during shipping, but which does not need to contain free liquid cryogen in order to keep samples cryogenically frozen. When properly used, Dry/Vapor Shippers do not present a risk of cryogenic liquid spills. Localized damage to skin and tissues due to exposure to freezing temperatures, often directly caused by a prolonged lack of blood flow to the area. A localized concentration of oxygen that is well below normal oxygen concentration in air. Any local oxygen concentration below 19.5% by volume constitutes an oxygen deficiency. The extent of the risk to life or health due to a locally decreased oxygen concentration. A localized concentration of oxygen exceeding normal oxygen concentration in the air (> 23.5% by volume), which can accelerate oxidation and combustion. Stress that a material undergoes when it changes temperatures. As materials are heated and cooled they expand and contract. The entire piece of the material does not expand or contract at the same rate, causing stress that may damage or break the material. The following tables identify the properties of and major hazards associated with the use of inert cryogenic liquids, focusing primarily on liquid nitrogen. The hazard list should not be considered exhaustive. 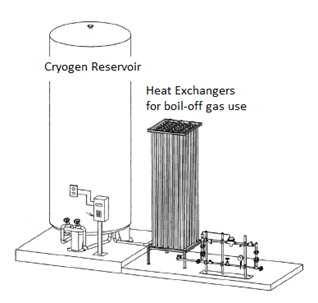 Contact with cryogenic liquid, its boil-off gases, or components cooled to these low temperatures can readily cause frostbite or cryogenic burns. See Work Process I. Release of these cryogens into the work area can damage equipment and property (e.g., frozen water pipes, damaged flooring, damaged electrical cables and their insulation). Cryogenic fluids confined and allowed to warm can generate very high pressures. Cryogenic liquid confined and allowed to warm to room temperature will generate pressure in excess of 10,000 psig. See Work Process G for an example of valve sequencing instructions for a cryogen fill station. This process illustrates the potential for rupture of piping or vessels if appropriate venting and pressure relief is not provided. The function of vent lines can be defeated by the formation of ice (from condensed moisture) in the vent line. With LHe, air or other gases can solidify to form this blockage (see Appendix C). If a cryogenic fluid is subjected to a large amount of heat input, a flash vaporization can occur. This will result in a rapid pressure rise that can be described as a BLEVE (boiling liquid expanding vapor explosion). The specific cryogen in question and its physical and chemical properties (see Appendix B, Appendix C and Appendix D). The volume and flow rates of the potential releases. The potential hazards presented by accumulation of the gases or liquids being vented (see Appendix B, Appendix C and Appendix D). These ratios mean that any accidental release or overflow of these cryogenic liquids will quickly boil into gas and may create an asphyxiation hazard by displacing the oxygen content of the surrounding area. In the case of liquid argon and liquid nitrogen, the nitrogen gas generated from malfunctioning equipment or spills will be cold and denser than ambient air. Even well-ventilated lab spaces that have pits or other low-lying (or recessed) areas could have the oxygen displaced by this cold, dense gas. See Appendix B, Appendix C and Appendix D for specific behavior of other cryogens. Large-volume sources used in small laboratory spaces or in poorly ventilated areas increase the asphyxiation hazard. Oxygen monitors may be advisable in some applications. The temperatures associated with cryogenic liquids can easily condense moisture from the air and cause the formation of ice. This ice can cause components or systems to malfunction (e.g., can plug vent lines and impede valve operation) or can damage piping systems. In the case of LHe, air itself can freeze solid and block vent lines. See Appendix C.
Building exhaust systems that are accidentally cooled to cryogenic temperatures can also be damaged by ice formation or the weight of the accumulated ice and the weight of the cryogen itself. The resultant runoff water when the ice melts can also present a slip hazard. The low temperature of cryogenic liquids will adversely affect the properties of some materials, resulting in system or vessel failure. The process for selecting materials to construct vessels and piping systems for cryogen handling must consider the behavior of the materials at cryogenic temperatures. Carbon steels and other metals can become brittle and fracture easily at cryogenic temperatures. Plastics, such as Tygon® tubing, become brittle and can easily fail in cryogenic applications. Common acceptable materials for construction include metals such as the 300 series stainless steels, some aluminum alloys, and copper or brass. Be sure to consult the appropriate references when selecting materials for cryogenic applications. Even when the appropriate materials are selected, thermal stresses can lead to failure in some applications. Joining materials with dissimilar coefficients of expansion can also generate thermal stresses. All components selected and used in cryogenic liquid systems must be designed and manufactured for such service. Liquid nitrogen is cold enough to condense the surrounding air into a liquid form. The concentration of oxygen in this condensed air is enhanced. This condensed “liquid air” can be observed dripping from the outer surfaces of uninsulated/nonvacuum-jacketed lines carrying liquid nitrogen. This “liquid air” will be composed of approximately 50% oxygen and will amplify any combustion/flammable hazards in the surrounding areas. Open dewars of liquid nitrogen can condense oxygen from the air into the liquid nitrogen and cause an oxygen enrichment of the liquid that can reach levels as high as 80% oxygen. Air should be prevented from condensing into liquid nitrogen with loose-fitting stoppers or covers that allow for the venting of nitrogen boil-off gas. Large quantities of liquid nitrogen spilled onto oily surfaces (such as asphalt) could condense enough oxygen to present a combustion hazard. Liquid helium can also condense air into a liquid or even solid with an enriched oxygen content. See Appendix C.
Studies of accident statistics involving cryogenics commonly include back strains or other lifting injuries associated with dewars. Although not specifically cryogenic in nature, this hazard is appropriate to note as a hazard associated with cryogenic applications. Care should be taken when lifting and moving cryogenic dewars. The proper use of carts or hand trucks can help prevent these injuries. Alternately, the use of low-pressure liquid-transfer equipment and procedures can replace lifting and pouring operations. Using cryogens in high ionizing radiation fields that can generate ozone or nitrogen oxides may cause a potential explosion hazard when the cryogen condenses quantities of oxygen from the atmosphere. The applicable control measure is to minimize the accumulation of oxygen into the cryogen and to keep containers free of hydrocarbon contamination. Transfer or venting of cryogens can generate, in some cases, noise levels that may require hearing protection. Sound levels in excess of 150 dBA have been recorded during routine tank filling. A redesign of the equipment or procedure could also be addressed in these cases. Liquid oxygen presents enhanced combustion hazards. See Appendix E.
Liquid hydrogen presents additional hazards of flammability and materials embrittlement. See Appendix D.
Liquid Helium presents additional hazards of materials embrittlement and solidification of air. See Appendix C.
This list is not to be considered exhaustive. Seek additional guidance from the appropriate division ES&H team for a thorough hazard analysis and safe operation of these systems. LBNL staff and affiliates must be aware of the possible accident scenarios for the LBNL environment. 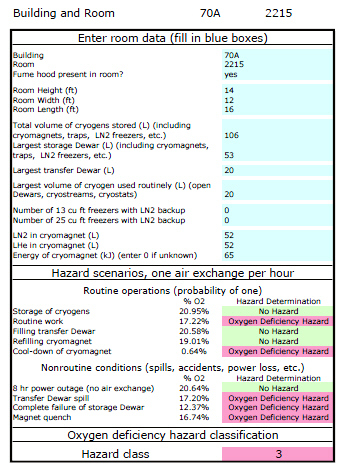 The following table lists known, common accident scenarios involving cryogen applications. Accidental releases (or overflows) of cryogenic liquid can present hazards and cause property damage, as noted in the hazards discussed above. The most frequent cause of accidental releases is inadequate training on specific hazards and procedures. These releases can come from automated level-control systems, but more frequently are the result of manual operations left unattended. The level of concern over these releases increases with the volume of the cryogen source. House liquid nitrogen systems present the potential for release of very large quantities of cryogenic liquid. Separate (stand-alone) supply dewars are inherently safer in this respect because they have smaller volumes. Releases of cryogenic liquid into a building or lab space are the most hazardous, presenting the primary hazards of asphyxiation, personnel exposure, and property damage. Releases into building exhaust systems also can present significant hazards. These releases typically occur when the operator opens a bypass valve in an attempt to precool the piping to cryogenic liquid temperatures and then mistakenly leaves the bypass valve open. These releases can adversely affect the normal operation of the building’s exhaust system or can cause the exhaust system to fail and release significant quantities of cryogenic liquid into the building’s air space. Pressure relief valves (PRVs) are required on cryogenic-liquid piping systems to prevent excess pressure buildup when the liquid is trapped between closed valves. Vent PRVs to a safe location (not into the lab or the ceiling plenum) to prevent a hazardous accidental release upon actuation of the valve or on failure of the valve to reseal. The PRV shall be rated for the specific application. For example, PRVs rated for liquid nitrogen are not appropriate for liquid oxygen applications. The PRV shall have adequate flow capacity to prevent further buildup of pressure. See Work Process D for more specific requirements. Back injuries may result from lifting cryogenic-liquid dewars. Storage dewars may be accidentally tipped over when crossing obstructions, such as door thresholds. Handle dewars with appropriate care. Ensure floor surfaces are free of obstructions and appropriate for moving dewars. Ensure all parts of the dewar (wheels, handles, etc.) are in proper functioning condition. Follow all manufacturer’s instructions for carts, dollies and wheeled dewars. When stored, cryogenic liquid cylinders shall be secured to a wall or other immovable object by brackets and chains designed for such a purpose. Two chains are required for cylinders more than 1 meter tall. Cryogenic liquids should only be handled in apparatuses specifically designed for that purpose. Accidents frequently occur when equipment not designed for cryogenic service is used, such as when a consumer-rated Thermos® bottle is used for cryogenic liquid or dry ice. Overpressure that ruptures the container is frequently the result. Accidents can also occur when cryogenic-rated equipment is inappropriately modified and the original safe-venting design is compromised. Cryogenic liquid containers may condense and/or freeze water from the air and leave water on the floor where workers may slip. Promptly clean up all puddles near cryogenic liquid containers. If a cryogenic liquid container is continually condensing water, put down absorbent materials around the container to keep the water from becoming a slip hazard. Post a “Caution: Wet Floor” sign or A-frame wherever water on the floor is common. None, atmosphere is not oxygen deficient. Mild effects similar to exposure to increased altitude. Reduced night vision, increased breathing volume, accelerated heartbeat, fatigue upon exertion. Dizziness, increased reaction time, fatigue upon mild exertion. Impaired attention, impaired judgement, impaired coordination, intermittent breathing, rapid fatigue, loss of muscle control. Very faulty judgement, very poor muscular coordination, loss of consciousness, permanent heart or brain damage possible. Inability to move, nausea, vomiting. Spasmodic breathing, convulsive movements, death in 5-8 minutes. Before beginning any work with cryogens or cryogen systems, workers must be familiar with the cryogenic equipment and systems they will be using. Using the Work Planning and Control Activity Manager system, in the Description of Work, activity leads shall identify the cryogen equipment and systems to be used, e.g., low pressure storage dewars, open dewar flasks, cryogen cooled vacuum traps, dry/vapor shippers, cryogen filling stations, etc. The Description of Work may also contain procedural information regarding the use of such equipment. The Activity Lead shall read all manufacturer’s instructions regarding the use of and controls for commercially obtained cryogen equipment, and make available this information to all workers on the Activity. For some cryogen systems, On-the-Job Training (OJT) may be required. It is highly recommended that this OJT requirement be documented in the Controls of the Activity. Appendix A contains detailed information on some of the most common cryogen systems. Note: When setting up, installing or designing any cryogen system, appropriate materials must be selected, and appropriate controls must be followed as for pressure systems, outlined in the ES&H Manual Chapter 7: Pressure Safety. Ensure that all Activity Leads and workers follow the Controls as laid out in the Activity. Verify that all equipment and systems to be used in the Activity are designed and engineered for cryogenic applications and meet the requirements outlined in Work Process D.
Ensure that all workers who use cryogens and cryogen systems have received the required training (including OJT) before performing work. Identify all cryogen equipment and systems to be used and include the information in the Description of Work section of the Activity in WPC. Read and understand all manufacturer’s instructions for the use of commercially obtained cryogen equipment and systems and make this information available to all workers. Design and administer On-the-Job Training for cryogen equipment and systems to all workers where required. Supervise workers to ensure safe performance of work, and authorize workers as appropriate. Read and understand the Description of Work and Controls sections of the WPC Activity, asking the Activity Lead for clarification where necessary. Understand the safe operation of the cryogenic equipment and systems to be used. Appendix A contains useful information on common cryogen systems. Pass all required safety training courses and receive all required On-the-Job Training. Follow all standard operating procedures as outlined in the Activity and demonstrated in On-the-Job Training. Adhere to all Controls listed in the Activity. Immediately report defective or unsafe cryogenic systems and equipment to the Activity Lead and take the defective or unsafe equipment/system out of service, marking it clearly to indicate that it is not to be used. Work within the scope of the Activity and immediately notify the Activity Lead if the scope needs to be changed before undertaking new work. 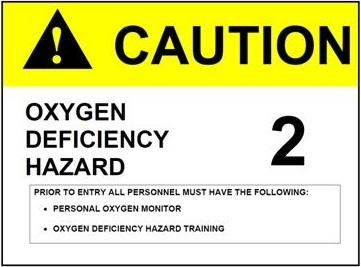 An easy-to-use oxygen-deficiency hazard (ODH) calculator has been developed as a screening tool, and can be used in many cases. However, sometimes the complexity of a cryogenic system will require a more in-depth quantitative analysis. The ODH assessments will need to address the risk of asphyxiation as well as risks from contact with the cryogenic liquid. Any reasonably foreseeable accidents (i.e., spillage, ice plug, cold burns, etc.) should be taken into account and appropriate contingency plans implemented to deal with such emergencies. Results of the risk assessment will be used to define cryogen controls. See Appendix B for additional details on the risk-assessment process for oxygen-deficiency hazards. Results of qualitative and quantitative risk assessments will be stored in the CHESS database for future reference and for use in establishing Work Planning and Control activities as required. For Risk Assessments that result in an Oxygen Deficiency Hazard Class of 1 or above, additional EHS review will be required. Based on the professional judgment of the Cryogenic Subject Matter Expert (SME), activity may be increased to Risk Level 3 and may include control measures as detailed in Table C-2. The oxygen-deficiency risk assessment will take into account the location of work and room size. Small or poorly ventilated rooms have a much higher risk of asphyxiation due to oxygen deficiency. For qualitative assessments of the potential to create an oxygen-deficient atmosphere, the simple ODH calculator will be used. To download the ODH Calculator, go here or click on the image shown below. For more information about the ODH calculator, see Appendix B. An example of the actual output from the analysis of a laboratory is shown below. If oxygen levels could fall below 19.5% during routine operations, suitable control measures should be implemented, e.g., filling or storing vessels in a ventilated room, installing a permanent oxygen monitor, or using smaller storage vessels. An example of a better-ventilated room will generally include a lab with an active fume hood with at least 25% bypass airflow and an active flow-monitor alarm that is set up so the alarm cannot be disabled by local residents. Handling or storing cryogenic liquids in a container not specifically manufactured for cryogen service. Plumbed cryogen systems - any situation in which cryogenic liquid is run through plumbing external to the storage cylinder. Exception: the cryogen cooling system built into a commercially available cryomagnet such as an NMR system. Filling of cryogen storage cylinders or dewars indoors. In these situations a quantitative assessment must be performed. If there is no oxygen deficiency hazard for any routine condition and the ODH hazard class is zero, no further action is required. If either the ODH hazard is not zero or an oxygen deficiency hazard is possible for any routine operation, the ODH of the room must be analyzed by an industrial hygienist, and further engineering and/or administrative controls may be required. Examples of acceptable quantitative methods for oxygen-deficiency risk assessment methodology include, but are not limited to, the Fermi Lab ODH methodology. While this is a complex and lengthy approach, it has the advantage of being applicable to any cryogenic liquid system and application, including custom-built systems. If a system cannot be modeled with the qualitative ODH Calculator (section 2 above), contact the Cryogenic Liquids SME for a full quantitative risk-assessment. The quantitative risk-assessment model will result in a fatality rate per hour for the overall use of the proposed cryogen system. Once the fatality rate (f) has been determined, the operation will be assigned an ODH class according to Table C.1 below, where the Risk [f] (hr-1) represents the probability of a fatality occurring per hour in the room. This model takes into account various failure rates and human error rates for the equipment and plumbing involved, and assumes that no oxygen monitors or other safety measures are in place. A risk of 10-7 represents a 1 in 10,000,000 chance of a fatality per hour, and a risk of 1 would theoretically indicate that anyone who enters the room would certainly die within an hour. The quantitative risk assessment must be conducted by the Cryogenic Liquids SME. Once the ODH hazard class has been determined, workplace controls can be put in place to minimize the risks. See Work Process D.
The following chart is intended to give a rough approximation of the limits for cryogen use based on the room size and volume of cryogen stored. This information is not to be used in place of an Oxygen Deficiency Hazard analysis as discussed in sections 1 through 3 above, but is merely intended to allow the reader to get a sense for what is and is not possible for a given space. Chart C.1 assumes that the cryogen user will store one pressurized cryogen cylinder in the room, for the purpose of supplying inert gas to some piece of equipment or instrumentation. The calculation allows for the simultaneous storage of one 8L non-pressurized transfer dewar, but does not allow for filling of the transfer dewar from the storage dewar. Filling of a transfer dewar in an enclosed space adds significantly to the oxygen deficiency hazard. Pressure relief valves, or PRVs, used on cryogenic liquid systems must be compatible with cryogenic temperatures and with the physical and chemical properties of the cryogen they are intended to vent. Most importantly, pressure relief valves must not cease to function in extreme cold temperatures, and must have the flow capacity to safely vent excess gas without further buildup of pressure inside the system. PRVs must also be designed such that a drastic change in temperature (from room temperature to cryogenic temperature) does not cause them to change the pressure at which they vent. Not all cryogenic rated PRVs are suitable for all cryogenic gases. A PRV that functions just fine with liquid nitrogen may not be compatible with liquid helium or with liquid oxygen. Therefore, users must never replace or repair pressure relief devices on cryogenic systems. If a pressure relief valve fails, the user should contact the manufacturer of the system for repair or replacement. As described in Work Process A, cryogenic liquids can build up extreme pressures if confined and allowed to warm. Cryogenic systems must be designed such that every isolatable part of the system which could conceivably have cryogenic liquid or gas introduced must have its own pressure relief, in the form of a valve or burst disk with adequate gas flow capacity, to prevent explosion from trapped cryogen. All cryogenic liquid systems which supply cryogenic liquid or vaporized gas from a cryogenic liquid source shall have a manual shutoff valve which is accessible form the point of use. This manual shutoff valve shall not be located in a hazardous area. If the point of use is immediately near the main cylinder valve, then the main cylinder valve is considered to be a manual shutoff valve for this purpose as long as the valve is readily accessible by anyone operating the system. Depending on the results of the Oxygen Deficiency Hazard (ODH) risk assessment (see Work Process C), a variety of engineering controls may be required to be implemented to safely handle cryogenic liquids. 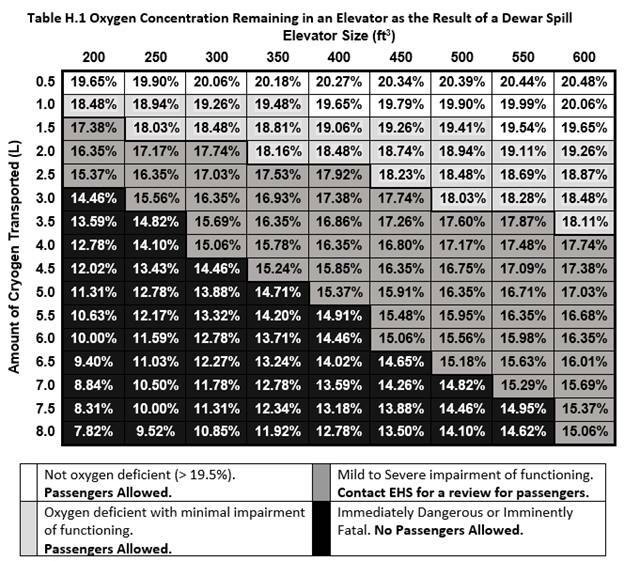 Table D.1 below lists possible engineering controls based on the Oxygen Deficiency Hazard class. This list is not exhaustive. 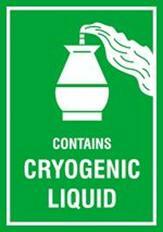 Entrances to labs that use cryogens must be posted with cautionary signs labeled with the cryogen icon (see below), as required by LBNL’s Chemical Hygiene and Safety Plan. Additionally, owners of bulk filling stations are highly encouraged to post a sign indicating the responsible persons for arranging cryogen delivery to the bulk station and for training new users to safely dispense cryogen. Engineered controls should be the primary means of worker protection. Where engineered controls cannot fully mitigate all hazards, workers must wear the appropriate PPE to augment any controls in place. Pressurized liquid nitrogen dewar-filling operations where Berkeley Lab staff and affiliates could be exposed to pressurized sprays or splashing. Making or breaking of pressurized cryogen line connections where residual amounts of liquid or gas under pressure may be encountered. Inserting room temperature objects into cryogenic liquid baths producing rapid boiling of the cryogenic liquid. Many other operations are considered low risk, and Table E.1 below summarizes the required PPE for low risk operations. Avoid pouring cryogens from above chest level. 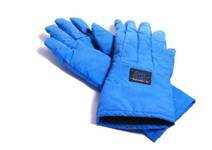 Thermally insulated hand tools may be an effective alternative to gloves. 1 Recommended. For a few limited operations, cryogen gloves or long-sleeve shirts/lab coats may not be needed. 2 When using a phase separator between the pressurized LN2 line and the open unpressurized dewar, the risk of a cryogen splash is substantially reduced. The primary function of a face shield is to protect the head and face in case of a splash. A good face shield should have adjustments to fit many head sizes and should provide good coverage of the entire front of the head, including around the sides. Some mechanism to lock the shield in place so that it doesn’t slip down and touch the chest is recommended to improve comfort. The shield should have a sloped top surface to direct splashes away from the top of the head and to prevent splashes from getting behind the shield from above. 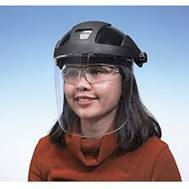 Even better is a face shield with impact resistance, per ANSI Z87.1, which is indicated by a marking of “Z87+” on the face shield surface, but this is not a requirement. Some models have replaceable clear shields so that when the shield becomes scratched or dirty, it can be replaced without purchasing new headgear. NOTE: You must still wear safety glasses underneath the face shield. Cryogen gloves should be made of non-porous material and should never be confused with heat resistant gloves. Cryogen gloves used to handle hot objects will likely melt, while heat resistant gloves used for cryogens offer no protection from frostbite or burns and can actually trap cryogen against the skin in the porous material of the glove. Ideally, cryogen gloves will be loose fitting and easy to remove. This feature makes it easy to get the glove off in a hurry if cryogen ever becomes trapped inside the glove against the skin. Before using cryogen gloves, always inspect them for ripped seams, tears or holes where cryogen could get inside the glove. NOTE: Cryogen gloves are intended for handling very cold items and to protect against an accidental splash. They are NOT meant to be submerged in a cryogenic liquid. Long pants/trousers are required during all work with cryogenic liquids; shorts and cropped pants are unacceptable. Furthermore, pants/trousers with cuffs can trap cryogenic liquid in the fold of the cuff and against the skin, increasing the chance of cryogenic burns. Cuffed pants/trousers are not permitted to be worn when handling cryogens. It is also recommended to wear loose-fitting pants/trousers so that any spilled or splashed cryogens will roll off the fabric without transferring significant heat into the skin. Tight jeans or leggings provide less protection against cryogen splashes. It is increasingly common to wear athletic shoes into the laboratory, which are often designed to keep the feet cool, with webbed mesh tops for air flow. Unfortunately, if the shoes allow airflow, they will also allow cryogen into the shoe through the top in the case of a spill or splash, and are often time consuming to remove. Appropriate shoes for use with cryogenic liquids should cover the entire top of the foot and should be able to at least temporarily repel liquids. Shoes with webbed or mesh tops are not permitted when handling cryogens*. *Closed toe shoes without mesh tops are required. Shoes with enclosed heel and entirely covered tops are recommended. LBNL staff and affiliates must complete the required training identified below before performing the indicated work activity or fulfilling the indicated role. Untrained LBNL staff and affiliates may temporarily work under the direct supervision of an appropriately qualified supervisor or work lead if the conditions/limitations of such work are documented (e.g., specific activities and duration) before performing the work. Complete EHS0170 as required by this chapter. Contact the Activity Lead for the operations you wish to perform and get added to the activity in WPC. Read and understand all required work descriptions and controls. Receive on-the-job training on site-specific procedures for safe operations from your Activity Lead before beginning operations involving cryogens. Obtain authorization from your Activity Lead to perform work as described in the activity. NOTE: This document is not a substitute for on-the-job training. The Activity Lead for your cryogen-related WPC Activity is the only one who can grant you authorization for any cryogen work. Depending on the outcome of the hazard assessment, the Cryogens Subject Matter Expert, or SME, may need to verify all designated controls are in place prior to the start of cryogen use. The Principal Investigator will arrange for the verification if one is indicated as part of the planning and assessment process. The following sections give an overview of good laboratory practice for a variety of operations involving cryogens. However, this document is not a substitute for on-the-job training. Always get the appropriate OJT from your Activity Lead before performing any work. †In some cases, tools with insulated handles may be an acceptable substitute for cryogen gloves. Your Activity Lead for the WPC activity can grant an exception after reviewing and observing the procedure, provided that your Supervisor also approves. Submerging closed sample tubes, vials or other containers into a cryogenic liquid bath presents another hazard. If the sample container leaks and allows cryogen inside, then is removed from the cryogen, the container may build up pressure and explode. The leak does not have to be large – as the container is cooled, the air inside it will form a slight vacuum that can pull in cryogenic liquid. Be particularly careful when removing closed containers from cryogenic liquid baths. The transportation of cryogenic liquids in elevators poses a potential asphyxiation and fire/explosion risk if workers become trapped in an elevator with a container of cryogen. Passengers must not ride in an elevator with a pressurized cryogenic liquid cylinder under any circumstances. For low pressure dewars, a risk assessment should be performed to determine the oxygen deficiency hazard in the elevator space in case the dewar spills or a passenger is trapped in the elevator with the evaporating cryogen for a prolonged period. Table H.1 provides guidance on when it is appropriate to contact EHS for a review to determine whether it is safe for passengers to accompany the dewar. If the oxygen level in the elevator could fall below 15% in the case that the dewar is spilled, passengers are not allowed to accompany the dewar due to the immediate danger to their life and health in case of a spill. It is always safer not to ride in an elevator with a cryogenic liquid dewar. Whenever a cryogenic liquid cylinder or a low pressure dewar is being transported in an elevator without passengers, a chain must be used to rope off the elevator entrance and a clearly visible sign must be posted to warn others not to enter the elevator while the cylinder or dewar is present. Once the cylinder or dewar reaches its destination, the person transporting the dewar or cylinder may remove it from the elevator, take down the chain and sign, and return the elevator to normal service. Contact your building manager to have chains and signs installed in elevators that are used to transport cryogenic liquids. The minimum concentration of oxygen left in an elevator following a liquid nitrogen spill can be calculated based on the amount of liquid nitrogen spilled and the volume of the elevator. A simplified equation is given below as a quick means to estimate oxygen concentrations in a given elevator. where C is the final oxygen concentration in percent by volume, L is the amount of liquid nitrogen spilled in liters, and V is the volume of the elevator in cubic feet. Self-transport by vehicle not allowed. Self-transport by vehicle must meet full DOT requirements. Call Shipping (x5084 or x4388) for assistance. Look for a viable alternative, such as shipping services. It is not recommended for researchers to transport cryogenic materials by vehicle. If no viable alternative exists, you will need to be a fully authorized worker on an approved WPC activity that includes the hazard “Transporting Cryogens by foot or by vehicle.” If your activity does not include this hazard, contact your Activity Lead. Recommended: Take EHS0657, Self-Transporting Haz Mat. Package materials in a double-walled, vacuum jacketed vessel, with outer packaging that has sufficient cushioning and absorbent materials to protect the inner vessel(s) from damage. Mark the outside of the packaging with the owner’s information, including a valid phone number. Place the container upright in an open area such as the open bed of a truck. Secure the container against movement and tipping. Under no circumstances is a cryogenic liquid cylinder or low pressure dewar to be stored or transported in the closed cabin or trunk of a vehicle, or on a bus or shuttle. Cryogenic liquid cylinders and dewars must be transported in the open bed of a truck or similar vehicle. Vendors such as Praxair, Airgas, and Matheson Tri-Gas are responsible for the safe delivery and transportation of large cryogen dewars to LBNL users. Note: Dry/Vapor Shipping Containers are by far the safest way to transport cryogenically frozen samples. These containers may be transported on the LBNL shuttles. Clearly mark the container as a dry shipper before boarding the shuttle. 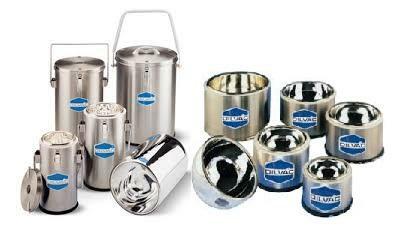 Contact the Cryogens SME for information on where to find and order dry/vapor shippers. Small quantities of liquid nitrogen or liquid argon may be transported in and around buildings in an appropriate low pressure dewar (fitted with a lid) by their carrying handles. Larger low pressure dewars may come with casters/wheels attached to the bottom, or the dewar may need to be secured to an appropriate dolly or cart. Check the entire route ahead of time to ensure that it is free of obstructions and obstacles which may cause a cart to tip. Heavy cryogenic liquid cylinders must be transported with an appropriate cart designed for the specific cylinder model. Appropriate PPE is still required when transporting cryogenic liquids around buildings (see Table E.1). Before transporting cryogenic liquid cylinders, the user must ensure that all process valves (gas supply, liquid supply, pressure builder, and vent) are closed. This section is intended for guidance only and is not a substitute for on-the-job training. Each fill station is different, and on-the-job training is required for each individual fill station. Authorization to use one fill station does not authorize a user to operate other fill stations. The appropriate points of contact for the fill-station operation. Any applicable personal protection equipment. The building point-of-contact for bulk ordering of liquid nitrogen/argon. The ES&H point-of-contact for notification of events, such as accidental releases. Check that the oxygen monitor (if applicable) is operational. Locate flex lines and fill valve away from point of discharge. Make any connections for fill or vent that are required. Position the dewar/cylinder for filling. Put on personal protective equipment (PPE). Wearing safety glasses is required for the open handling of cryogenic liquids. Additional PPE, such as face shield and gloves, may also be required. PPE requirements depend on the specific system design and operation. Caution: Safe use of this system requires 100% manned operation. Operators should not leave the area with a valve either in the open or partially open position. When necessary, precool the cryogen line by opening the bypass valve and allowing flow until the supply line is adequately precooled. This may be evidenced by frost on the valve or piping and components. Do not leave the area during line precool. The line is precooled in an effort to minimize the quantity of nitrogen gas that will be vented into the laboratory air space during the filling process. Close the bypass valve at this time. The line should be adequately precooled so that when the fill valve is opened, liquid-phase nitrogen (or a minimum of gas phase) will flow. Slowly open the fill valve. You should be able to hear the cryogen flowing through the line and into the dewar/cylinder. Do not leave the area during the filling operation. When the dewar/cylinder is full, close the fill valve and ensure that both valves are in the fully closed position. Vent off any residual pressure, then disconnect any connections made and remove the dewar/cylinder from the fill station. *Not all fill stations include a bypass line to precool the lines. NOTE: Appendix F contains some useful calculations that can be used to assess the risk of asphyxiation when using a fill station indoors. Skin contact with either cryogenic liquids or with uninsulated materials at cryogenic temperatures can cause rapid burns. Often, burns from direct contact with cryogenic liquids are not accompanied by pain but by a feeling of numbness and cold. The affected area may not hurt until it thaws considerably. Contact with materials at cryogenic temperatures can instantly freeze any water near the surface of the skin and cause it to stick to the cold material, in addition to causing burns, which may tear the flesh when it is removed. The eyes are especially susceptible to cryogenic damage and can suffer irreparable harm from direct contact with a cryogenic liquid splash. Even vapors that are near cryogenic temperatures can damage the eyes. Large exposures to cryogenic liquid or cryogenically cold vapor may induce hypothermia, wherein a person’s core body temperature drops to dangerous levels. If the body is not warmed, heart and respiratory failure can result, potentially leading to death. If the affected area is extensive, the contact with cryogen or a super-cooled surface was prolonged, skin has been torn from freezing to a cold surface, or if the victim is in distress call x7911 from any main site land line, 911 from a cell phone, or use the local emergency line from off-site locations. Thaw the affected area with room temperature (not hot) water. Loosen any clothing or PPE which might reduce blood flow to the area. Watch for signs of shock – cold sweating; paleness; rapid breathing and pulse; or nausea with or without vomiting. If any signs appear, immediately call emergency services, take the victim to a warm place, lie them down, and elevate the feet. If blisters appear, the burn will require medical attention. For more severe cases, call x7911, 911 from a cell phone, or a local emergency line. Otherwise, take the victim to seek medical attention as soon as possible and report the incident to the victim’s Activity Lead and Supervisor. Cryogenic burns are very painful as they begin to thaw. Aim to thaw the affected area slowly so that medical attention arrives before thawing is complete. Infection is a serious concern with cryogenic burns. If the burn is thawed before medical attention is received, cover the area loosely with sterile dressings. Remove the worker from the source. Open eyes wide to facilitate evaporation. Immediately call x7911 from any main site land line, 911 from a cell phone, or use the local emergency line from off-site locations. Flush the eyes with lukewarm but not hot water for 15 minutes to warm the tissue. Do not delay medical attention, as cryogen burns to the eyes can lead to permanent damage and loss of vision; have someone else call while you assist the employee. Symptoms of hypothermia include: shivering, dizziness, nausea, fast breathing, confusion, lack of coordination, trouble speaking, fatigue and rapid pulse. In more severe cases, breathing may be slow and shallow and the pulse may be weak. If hypothermia is suspected, immediately call emergency services at x7911 from the main site, 911 from a cell phone, or use the local emergency line. If the area is still cold, take the victim to a warm area, remove any wet and/or cold clothes, and cover the victim with copious blankets or garments to warm them up. Do not move the victim more than is absolutely necessary. Do not apply hot water or direct heat. Do not apply heat to the arms or legs. Small amounts of excess cryogenic liquid from processes may be collected in an approved dewar flask and left to evaporate inside of a fume hood. Excess cryogenic liquid in a low pressure dewar may be left to evaporate naturally from the lidded dewar, so long as the room is already approved for storage of such a dewar. NOTE: Even relatively small quantities can damage equipment or facilities and can crack floor tiles, damage water pipes, and damage electrical insulation on wiring. Also, consider the hazard presented by the boil-off gas when any significant quantities of a cryogenic liquid are released. Do not pour cryogenic liquid onto floors, onto surfaces inside fume hoods, into any buckets or containers not approved for cryogenic liquid storage, or into any sinks or drains. Contact LBNL Waste Management for assistance in determining the best way to dispose of cryogenic liquids. LBNL staff and affiliates must apply the requirements for pressure safety aspects of a cryogenic-liquid-handling system as stated in the ES&H Manual, Chapter 7, Pressure Safety. For LBNL designed and assembled systems, the system owner must compile a data package according to the requirements in the ES&H Manual, Chapter 7. Any significant accidental releases must be reported to the appropriate supervisor or work lead. Notification through an emergency and non-emergency hotline may be appropriate, depending on the severity of the release. Any personnel in the vicinity who could be exposed to the hazards of the release must be notified. A predetermined point of contact, such as the person responsible for ordering the product, could also be useful because the schedule for re-ordering may be affected by large-volume releases. NOTE: Incidents that are reported to the non-emergency hotline are useful in tracking and analyzing accident and failure scenarios, determining trends, and changing engineering configurations or procedures. Results of qualitative and quantitative risk assessments will be stored in a database for future reference and for use in establishing Work Planning and Control Activities when required. Risk Assessments conducted in the field by persons other than the SME must be emailed to the Cryogens SME. Commercial (off-the-shelf) vessels which are intended and engineered for cryogenic service may be used as is, but available owner or operator manuals should be retained for reference as part of the system data package. Image Copyright 2017 Chart Industries, Inc. Used with permission, all rights reserved. Low pressure dewars are only intended for short-term storage of cryogenic liquids, at maximum several days. They are typically only filled on demand. These systems consist of a vacuum jacketed cryogen reservoir, which is usually made of a silvered glass, with an outer casing of aluminum or steel. A loose fitting plug style cap, usually made mostly of foamed plastic for better insulating properties, is used to allow for the release of boil-off gases so that the pressure inside the dewar does not exceed atmospheric pressure, while also keeping air out to avoid condensation of liquid oxygen. In general, these dewars are small and easy to transport. The smallest can be carried with handles, while the larger models may come with wheels mounted to the bottom, or a small cart or dolly may be needed. The vacuum space around the cryogen reservoir is equipped with a pressure relief valve in case the inner reservoir cracks and allows cryogen into the vacuum space. In that scenario, pressure might build up inside the vacuum space and rupture the dewar, so instead it is safely vented through a relief valve. It is important to inspect all dewars carefully before use. Check that no corrosion is visible on the outside of the casing. The safety valve should be intact and should not be bypassed or defeated in any way. The plug cap should slide easily into the neck of the dewar and should not seal or become stuck. During use, the dewar should not form ice on the outside of the aluminum casing or on the cap. If ice does form on the outside of the dewar, it indicates that the dewar may have lost vacuum and may no longer be insulating enough for cryogenic liquid storage. Additionally, if there are cracks in the inner silvered glass reservoir, liquid cryogen may get into the vacuum space and upon warming of the dewar the entire vessel can explode from the expanding cryogen. 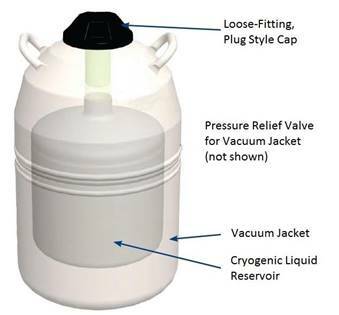 If the foamed plug portion of the cap breaks off or is removed, then the remaining plastic cap will build up ice due to the lack of insulation between the plastic and the cryogenic reservoir. Without proper insulation, the dewar may be allowing more gas to escape into the room than was accounted for in the initial risk assessment for the use of cryogen in that particular room. In the case of a damaged dewar, it is possible that the cryogen reservoir may shatter violently and unexpectedly due to the large amount of stored energy in the pressure differential created by the vacuum jacket. If there is any sign of damage or loss of insulation, the dewar must immediately be taken out of service and marked as defective to prevent its further use. Only individuals who are trained, qualified and experienced in the repair of this type of vessel should ever attempt to repair a damaged dewar. Note: Consumer products such as Thermos® bottles and vacuum flasks are not approved for cryogenic applications. Although the container itself may hold cryogenic liquid in an adequate manner, the lid, even when loosely applied, does not allow for proper venting of boil-off gases and may lead to an explosion of the pressurized vessel. These containers must never be used for cryogenic liquids, even for a short period of time. Before purchasing any dewars or “vacuum flasks” for use with cryogenic liquids, check the specifications or call the manufacturer to confirm that it is intended for cryogenic liquid service. Images copyright © Day-Impex Ltd. All rights reserved. WARNING! Vacuum flask – may shatter unexpectedly, may cause injury. Wear safety glasses. Before ever using a dewar flask for the first time, unpack and inspect it for any cracks, scratches, or chips. Tiny cracks or scratches in the glass will expand over time and eventually the glass will lose integrity and shatter. Some manufacturers instruct the user to wash the inside of the dewar flask gently with soapy water, rinse it with deionized or distilled water, and dry it thoroughly with a soft, lint free material before the first use. This removes any dust, debris or residue from the packaging material. Follow the manufacturer’s instructions. Some manufacturers recommend pre-cooling the dewar before filling it completely with cryogenic liquid. This can be done by adding a small amount of cryogen to the flask, swirling it, and letting it stand for 5-10 minutes before filling the dewar the rest of the way. Before each and every use of the dewar flask, inspect it for cracks, chips or scratches. Ensure that the dewar flask is completely dry before filling, as water trapped within miniscule cracks and scratches which subsequently freezes (and expands) can cause the dewar to shatter. Handle dewar flasks with care. Place them only on flat, level surfaces to prevent them from tipping over. Take particular care not to drop dewar flasks or allow them to fall any distance. Do not use any tools to scrape the inner glass of the dewar flask. Do not use any hard tools to prod at contents inside a dewar flask. Do not drop objects into a dewar flask; place them gently. When using a dewar flask to cool a vacuum trap, it is recommended to use a blast shield in front of the trap to protect the researcher from flying shrapnel in case the vacuum trap explodes. While using the dewar flask, it should not form ice on the outside casing, although condensation is normal. If any damage is evident in the form of cracks, scratches, chips or otherwise, immediately remove the dewar flask from service. Do not attempt to repair a damaged dewar flask. The design of cryogenic liquid cylinders is necessarily more complex and robust than the atmospheric pressure dewars (see diagrams above) due to the large pressures involved. When extracting cryogenic liquid from the cylinder, the vapor pressure of the cryogen causes the liquid to flow up through a tube and out the liquid valve. Some cylinders may come with a liquid valve built in, while others may require a tube to be inserted into the cylinder, often called a “stinger”. The cryogenic liquid will be released at high pressure because of the pressure inside the cylinder. Use a lower pressure (22psig) cylinder for liquid service to minimize the risks from high pressure cryogen streams. See Work Processes D, E and H for more information on engineering controls, required PPE, and good laboratory practices. Gas is extracted through a separate valve, which draws from the headspace of the cylinder, above the liquid level. This gas will be just barely warmer than the boiling point of the cryogenic liquid and still poses a significant hazard for burns and frostbite. The high pressure (230 or 350psig) cylinders are usually preferred for gas use because they can deliver higher flow rates, but for applications which require only low flow rates and low pressures, the low pressure cylinders may be used. In order to achieve even higher flow rates, many cryogen cylinders are equipped with a gas use vaporizer, which directs cryogenic liquid through tubing outside of the normal liquid reservoir to vaporize it for immediate use as a gas (see the diagram above). Where necessary, a cryogen cylinder can also be equipped with a pressure builder to allow the user to manually increase the pressure inside the cylinder for an application that requires it. Conversely, where pressure increases more rapidly due to cryogen evaporation than the gas is used, some cylinders have an economizer installed to direct the excess pressure inside the cylinder to the gas use valve instead of using the gas use vaporizer, reducing the amount of cryogen lost to venting through the pressure relief valve. Before withdrawing gas from a cryogenic liquid cylinder, it is important to verify that the gas use valve is connected and not the liquid valve. NOTE: Cryogenic liquid cylinders are only intended to be operated in a fully upright position. Never attempt to operate a tilted cylinder (e.g., while on a cart), and never lay a cryogenic liquid cylinder on its side. Cryogenic liquid cylinders will always have a pressure gauge, a pressure relief valve and a rupture disk installed to prevent over-pressurization of the cylinder. 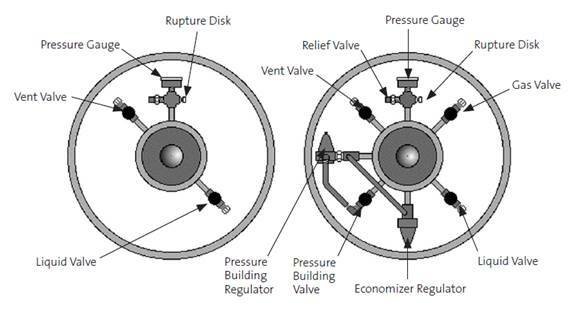 The pressure relief valve and rupture disk must be able to withstand cryogenic temperatures without losing performance or altering the pressure at which they vent. A vent valve provides another means of reducing the pressure inside the cylinder, but manually. Before filling a cryogenic liquid cylinder, it is important to inspect the cylinder for damage and to verify that the cylinder is approved and designed for the particular cryogen service. For example, liquid helium, liquid oxygen and liquid hydrogen in particular all have very specific requirements for the design of the cylinders (see Appendices B, C and D); these gases should never be filled into a cylinder that is not of the correct design. Some cryogenic gases are even dangerously incompatible, such as LH2 and LOx – an explosive combination. Most cryogenic liquid cylinders will indicate what type of gas they are meant to hold, either by way of a label with the gas identification, or with a clearly marked tag. Never fill a cryogenic liquid cylinder with a different gas than the one for which it is marked. Common signs of damage on a cryogenic liquid cylinder include rust or corrosion on any of the parts, dents on the external surfaces, tubing and valves that are bent and should be straight, missing pressure relief valves, a burst rupture disk, or a pressure gauge that reads greater than ambient pressure when the cylinder is empty. Never fill a cylinder which shows any sign of damage. It is also important to watch the cylinder once it is filled for any sign of abnormal operation. When withdrawing large flow rates of gas for prolonged periods of time, some ice formation is normal around the gas valve and fittings and sometimes on the sides of the cylinder. Some ice may also build up on the pressure relief valve if the cylinder is venting frequently. However, any ice buildup that cannot be explained through normal operation of the cylinder may be a sign of a defective cylinder. If any signs of damage are observed, or the cylinder behaves abnormally in any way, take the cylinder out of service immediately and contact the manufacturer of the cylinder or the vendor that supplied it. Only individuals who are trained, qualified and experienced in the repair of this type of vessel should ever attempt to repair a damaged cryogenic liquid cylinder. In many cases, a vendor such as Praxair, Airgas or Matheson will deliver a cryogenic cylinder pre-filled, and pick up the empty cylinder. The vendor is then responsible for inspecting the cylinders before filling and ensuring safe operation. However, it is still important to watch for any unusual signs during operation of the cylinder, such as abnormal ice build-up. If anything seems abnormal, call the vendor immediately to have them pick up the cylinder, and be sure to inform the vendor that you suspect a defect. If gas is being withdrawn, the flow rate may be too high for the cylinder. If gas is not being withdrawn, check that all valves are completely closed and that the cylinder is not empty. Check that the pressure relief valve is not venting. If the cylinder is venting below its marked operating pressure, call the manufacturer or vendor. If the cylinder is not venting, try opening the pressure builder (if present). If opening the pressure builder does not help after a few hours, check that all valves are completely closed. If pressure is still low with all valves completely closed, the cylinder may be leaking – call the manufacturer or vendor. Check that the pressure builder is fully closed. If liquid loss rate is normal, the withdrawal rate of gas may be too low to keep up with normal vaporization. This is a common situation. If liquid loss rate is abnormally fast, is ice forming anywhere? Ice on the pressure relief valve can lock the pressure relief valve in the open position – call the manufacturer or vendor for instructions to de-ice the pressure relief valve. Ice forming on the sides of the cylinder while it is venting too frequently indicates loss of vacuum jacket integrity – call the manufacturer or vendor and explain the situation. For valves that are in use, ice buildup is normal and particularly high gas withdrawal rates may cause the entire top of the cylinder to ice over. 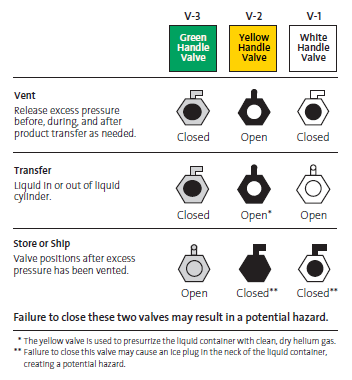 If the valves are all fully closed but forming ice, a valve may be leaking – call the manufacturer or vendor. For particularly high gas withdrawal rates ice on the sides of the cylinder is normal, and the ice may persist for a day or two. Ice is normal for a day or two after filling. If gas withdrawal rate is low or no gas has been withdrawn recently, the cylinder was not recently filled, and especially if the liquid loss rate is abnormally fast, this indicates a loss of vacuum jacket integrity – call the manufacturer or vendor. Do not touch the liquid. It may be liquid cryogen. Check that the dripping valve is completely closed. If it continues to drip, put on cryogen gloves and carefully catch a drop or two in a dewar flask or a paper cup, and check to see if it stays wet. If it remains wet, it is just condensation dripping. If it evaporates almost immediately, the cylinder is leaking cryogenic liquid. Call the manufacturer or vendor immediately, take the cylinder out of service, and warn others of the risk of contact with cryogenic liquid until the cylinder is removed. Vent the cylinder manually with the vent valve to keep the pressure below the pressure relief valve setting. Call the manufacturer or vendor immediately. The most likely cause is that the regulator on the cylinder is out of adjustment or defective – if you have another regulator attached to the gas service valve you can check to see if they agree, but the cylinder should still be taken out of service immediately and either returned to the vendor or else repaired by the manufacturer or a trained, qualified and experienced individual. Cryogen filling stations are a long-term solution to frequent cryogenic liquid needs. Facilities and the EHS division work with a vendor to design and install a unit such as the one pictured above. The tank can be filled from a large cryogen transport vehicle, and both gas and liquid cryogen can be withdrawn from the system. These systems are most commonly used for liquid nitrogen and can be used to fill either a low pressure dewar or a cryogenic liquid cylinder. Often, the natural boil-off gas is also used (e.g., “house nitrogen”) after passing it through a heat exchanger to warm it to room temperature. In-depth on-the-job training is required for each individual filling station, as they are all unique installations. More information on cryogen filling stations and how to use them can be found in Work Process H.
Generally, cryomagnets are used for NMR and MRI applications, though they are also used in particle accelerators, some mass spectrometers, and for magnetic separations. The cryomagnet consists of a coil of wire, just like a standard electromagnet, but the wire is made of a material which is superconducting at very low (i.e., cryogenic) temperatures. Below a certain temperature threshold (usually ~10K), the wire begins to conduct current with insignificant resistance, allowing much higher currents, and thus the magnet can attain much higher field strengths, up to 25-30 Tesla. For comparison, a standard refrigerator or bulletin board magnet has a field strength of approximately 5/1000ths of one Tesla, and high-strength rare-earth magnets, such as neodymium magnets, have a field strength at their surface of roughly 1.25 Tesla. This document does not cover the hazards associated with high strength magnetic fields; information on the nature of cryomagnets is provided solely for context. As the name implies, cryomagnets require cryogenic temperatures to operate. While a few high-temperature superconductors do exist, most superconductors require temperatures below about 10K (-263°C or -440°F) to exhibit superconducting properties; above that temperature, they conduct electricity like any other normal material, with normal resistance. This presents a risk because if the cryomagnet is allowed to warm to above ~10K it will lose its superconductivity and will immediately begin to produce significant heat as its resistance returns to normal. This is accompanied by a “magnet quench”, in which all of the cryogenic liquid that was being used to cool the magnet is rapidly boiled off by the heat produced by the coil. Since cryomagnets typically contain large volumes of both liquid helium and liquid nitrogen, this can cause severe and rapid oxygen depletion in the room, reducing oxygen levels to well below concentrations that can be fatal in a short period of time. These systems usually necessitate engineering controls such as oxygen monitoring, as described in Work Process D.
Magnet quenches are rare (at least one system at LBNL has gone for over 10 years without a single quench), but they are more likely to occur during maintenance of the system and filling of the cryogen reservoirs. Magnet quenches can also occur if the level of cryogen in the system drops too low to sustain superconducting temperatures, so it is important to follow the manufacturer’s instructions for the filling schedule of the cryogen reservoirs. Only trained personnel should ever attempt to fill the reservoirs or perform maintenance on a cryomagnet system. A cryostat is a system designed to maintain a cryogenic temperature in some experimental volume, device or sample chamber. There are multiple types of cryostats, but they all operate in roughly the same way: a cryogenic liquid is used, with the aid of heat exchangers, to cool the device of interest and keep it at a stable, cryogenic temperature. The two most common types of cryostat are Continuous Flow Cryostats and Bath Cryostats. In a Continuous Flow Cryostat, a cryogenic liquid is flowed through a heat exchanger assembly and then allowed to warm, vaporize and vent into the atmosphere. The tube that carries the cryogen flow is typically vacuum shielded to keep the cryogen cold on its way to the heat exchanger, and is open to atmosphere past the heat exchanger such that the line is never pressurized. The cryogenic liquid is typically extracted from a cryogenic liquid cylinder. A Bath Cryostat is the simplest type of cryostat and typically consists of a small reservoir of cryogenic liquid that is brought into thermal contact with the device of interest. The bath is allowed to vaporize into the atmosphere as it cools the device, and must be replenished either from a liquid flow from a cryogenic liquid cylinder, or by manually pouring more cryogenic liquid into the bath from a low pressure dewar. Commercially available cryostat systems are available where the user need only connect a full cryogenic liquid cylinder to the device. When using a commercially available cryostat, users must follow all manufacturer’s instructions and safety precautions, in addition to the requirements in this document. NOTE: A risk assessment of the oxygen deficiency hazard is still necessary, even with a commercially available cryostat system. Vacuum-jacketed vessels are available for both storage and shipping of cryogenically frozen samples. Vessels for storage and shipping differ somewhat, but both are constructed similarly to the low pressure dewars described in (i). Cryogenic Storage Vessels are essentially a wide mouth version of low pressure dewars but also include a rack in which samples can be loaded and lowered into the cryogenic liquid. The vessel can be filled just like a low pressure dewar. The rack is designed to fit the specific storage vessel and can be easily lifted out. Users should wear cryogen gloves when inserting or removing samples. See Work Process H, section (i) for safe laboratory practices that apply when loading samples into a cryogen storage vessel and for removing closed containers from cryogenic liquid. Cryogenic Dry/Vapor Shippers look much like their storage counterparts, but differ in one major way: these shipping containers only hold cryogenic liquid trapped within an absorbent material so that the cryogenic temperature is maintained inside the vessel, but there is no potential for a spill during transportation and shipping. Follow all manufacturer’s instructions for loading the shipper, adding cryogenic liquid if necessary, and packaging the vessel for transport or storage. Packaging the vessel in a sturdy box with cushioning and absorbent materials to protect the Shipper from damage. Marking the outside of the package with the owner’s information, including a valid phone number. Never transporting such a Shipper in the cabin or trunk of a vehicle or on a shuttle bus (set the container in the open bed of a truck instead). Securing the container against movement during transport. Before purchasing or shipping a Cryogen Dry/Vapor Shipper, please contact the Cryogens SME for additional assistance and to have the vessel approved. See Work Process H section (ii) for more information on transport and shipping. Before use, these vessels should be inspected for signs of damage, much like any low pressure dewar. In both cases, the vacuum jacket can fail and potentially allow cryogenic liquid to enter the vacuum space. Generally, the pressure relief valve is on the bottom of this type of vessel. After loading the vessel with cryogenic liquid, ice should not form on the outside of the aluminum casing – ice formation is a clear sign that the vacuum jacket has failed. If any signs of damage are evident (e.g., dents of the casing, scratches inside the silvered glass cryogen reservoir, corrosion, missing or damaged pressure relief valve, ice formation, etc.) the vessel should be taken out of service and marked as defective. Only individuals who are trained, qualified and experienced in the repair of this type of vessel should ever attempt to repair a damaged cryogenic storage vessel or shipper. 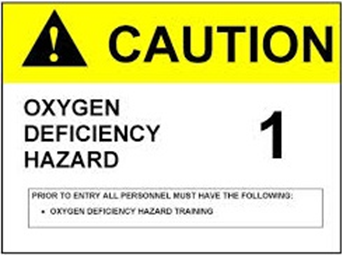 The Oxygen Deficiency Hazard (ODH) calculator is a simple tool that allows rapid evaluation of the oxygen deficiency hazard of a room using conservative assumptions. It is well suited to simple cryogenic systems including the storage and filling of dewars, the use of freezers with cryogenic liquid backup systems, and the use of cryogenic liquids to cool cryomagnets. More complex systems will require a quantitative approach, as discussed in Step 6 below. If either the ODH hazard is not zero or an oxygen deficiency hazard (oxygen level drops below 19.5%) is possible for any routine operation, the ODH of the room must be analyzed by an industrial hygienist, and further engineering and/or administrative controls may be required. Self-explanatory. Units are in feet. Self-explanatory. Units are in liters. Includes the volume of all storage dewars plus any other device that contains cryogens, e.g., cryomagnets, freezers, cold traps. Note that all cryogens are assumed to be liquid helium with an expansion factor of 757:1, which is slightly conservative compared with that of liquid nitrogen (696:1) and slightly non-conservative with respect to that of liquid argon (847:1). Self-explanatory. Units are in liters. Largest dewar by volume in the room can be a storage dewar, freezer, cryomagnet, etc. Transfer dewar is a smaller dewar that is filled from a storage dewar and is used to transfer cryogen to another location. These are typically 4 L dewars, but larger dewars for cryostats are also to be included here. Units are in liters. Largest volume of cryogen that is used in an open system. This includes open dewars, and dewars used with cryostreams, cryostats, etc. Units are in liters. Self-explanatory. If the freezer is smaller than 13 ft3, include it in the 13 ft3 box. If it is much larger than 25 ft3, enter the volume of the freezer divided by 25 (this quotient needs to be multiplied by the number of large freezers, of course). Self-explanatory: the volume of the LN2 jacket, if present, in liters. Self-explanatory: the volume of LHe in the cryomagnet dewar, in liters. Energy stored in the cryomagnet in kilojoules. If unknown, just enter a zero in this box. The magnet will be assumed to volatize all of the stored LHe in a quench. The probability of death upon exposure to this concentration of oxygen is calculated using the Fermilab methodology. Then finally, the probability of death for each scenario is multiplied by the probability of that scenario occurring, and the products for all scenarios are summed to give an overall probability of death resulting from cryogen use in this room. The ODH class is assigned using the values in Table C.2, below. Although this model uses a formula for the %O2 in the absence of ventilation for the probabilistic model, there is an implicit assumption of one air exchange per hour. Release of all stored cryogen is assumed to be 5% per day. The reported values are 2% per day for typical storage dewars, but the 5% value is used to account for the fact that some dewars, especially high-pressure storage dewars, cryomagnets, and cryogenically cooled traps, have a larger release rate. All cryogen is assumed to be liquid helium with an expansion ratio of 757, which is slightly conservative compared with that of liquid nitrogen (680). But the liquid helium expansion ratio has the advantage that less data needs to be entered since only cryomagnets, not different types of cryogens, are entered into the model. Work with cryogen that will actively be generating gas includes such tasks as working in open dewars (crystal mounting) or using liquid nitrogen to actively cool experiments (cryostream). All of the cryogen in the dewar is assumed to be used within one hour. Cryogen is assumed to be liquid helium for the purpose of expansion ratio. A smaller, transfer dewar is filled from a larger, storage dewar. Loss rate is assumed to be 10%. When a cryomagnet has its liquid helium and liquid nitrogen reservoirs refilled, loss rate is assumed to be 10%. Both dewars are assumed to be filled at the same time. A cryomagnet is initially cooled with liquid nitrogen then cooled with liquid helium, which may be in separate reservoirs. All operations are assumed to be finished within one hour. The liquid nitrogen loss rate is 20% of the volume of the reservoir, and the liquid helium loss rate is 50% of the volume of the reservoir. Based on cool down of a Quantum Designs Magnetic Property Measurement System on 10/26/09, 76 L of LHe is needed to cool and fill a 56 L reservoir. LN2 loss rate is an estimate and is probably too high since liquid nitrogen has a high heat of vaporization. The assumption is that power is lost to a building (especially a bio lab containing freezers with liquid nitrogen backup) for 8 hrs before someone notices (this may not be a very plausible scenario). All of the nitrogen evolved from storage dewars and the nitrogen used to cool down the freezers evaporates into the lab. The rate of liquid nitrogen use for freezer backup was obtained from Fisher and So-Low and is 7 lbs/hr and 11.6 lbs/hr for 13 cu ft and 25 cu ft –80 °C freezers, respectively. The assumption is that this event happens once every two years, which is grossly conservative; this scenario is not plausible in the absence of an earthquake (p=5.7x10-5/hr). Transfer dewar is knocked over and all cryogen evaporates into room. The assumption is that this event happens approximately four times per year (p=4.6x10-4/hr). Dewar fails (valve is snapped off) and all cryogen is lost into room and evaporates in an hour. Failure rate is from Fermilab for failure of vacuum jacket of dewars (p=1x10-6/hr). This is in good agreement with our observations of one failure in 10 years among ~10 dewars in the 70/70A complex (p=1.14x10-6/hr). 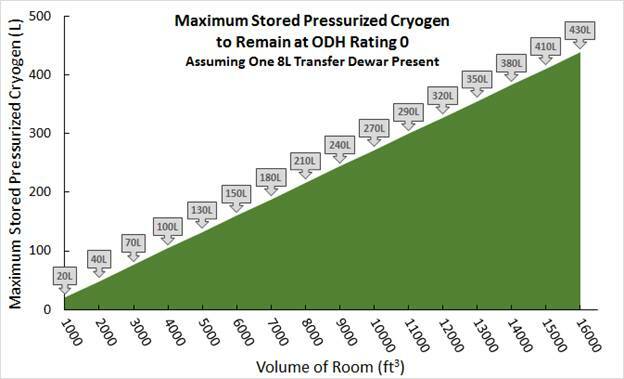 The oxygen level is calculated for the largest dewar that can fail, and the probability is multiplied by the total volume of stored cryogen divided by the volume largest dewar to account for the probability of other dewars failing. Cryomagnet ceases to be superconducting and boils off helium equivalent to the stored energy (heat of vaporization 0.0845 kJ/mol). If the stored energy is unknown, all of the helium in the jacket is assumed to be vaporized. Vaporization of liquid nitrogen is not an issue due to its much higher heat of vaporization (5.6 kJ/mol), which means that 66 times less nitrogen would be released than helium. Failure rate is from Fermilab (p=1x10-6/hr). Liquid helium is the coldest of all the cryogens, with a boiling point of approximately 4K (-268.9°C or -452.1°F). This incredibly low temperature is cold enough to solidify air (the nitrogen and oxygen, not just the water) into a kind of ice. Because of this, it is far more common to accumulate solid obstructions in the valves of pressurized liquid helium cylinders than with nitrogen or argon. Users of liquid helium cylinders must exercise extreme care to prevent ice obstructions, which can cause liquid helium vessels to over-pressurize rapidly. At the ALS, this exact situation occurred. A liquid helium cylinder was in use at the ALS, and a user failed to close one of the valves when finished with their operation. Nothing seemed amiss until a few days later, when another user went to withdraw liquid from the cylinder. This particular cylinder required that a long metal tube, a “stinger”, be inserted through the top of the cylinder all the way to the bottom of the cryogenic liquid reservoir in order to withdraw liquid. But the user found that the tube would not insert all the way; instead, it hit something hard well above the bottom of the reservoir. It turned out that air had entered the cylinder through the valve that was left open, had frozen solid on top of the liquid helium, and formed an impenetrable plug. Had the situation not been discovered and remedied, the cylinder may have exploded as the helium trapped below the plug slowly vaporized and built up pressure in the confined space. Unlike nitrogen and argon, which are denser as gases than air, helium as a gas is far less dense than air. With liquid nitrogen and liquid argon, the largest danger of asphyxiation is close to the ground, especially in recessed areas. However, with liquid helium the largest danger of asphyxiation is at ceiling level, where the helium gas will accumulate and displace oxygen most rapidly. Therefore, when working with cryogenic helium, users must be aware of what is above them. People on catwalks or ladders will be more quickly affected by a release of helium gas than someone on the ground. Pressurized liquid helium cylinders are rarely operated at high pressures like liquid nitrogen or liquid argon which come in cylinders with pressures up to 350psig. Instead, most liquid helium cylinders are operated at less than 20psig. 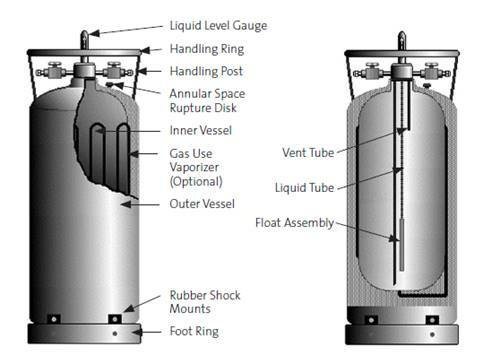 Cryogenic liquid cylinders used for helium sometimes have more complex insulation systems to minimize loss rates, which can be quite high for liquid helium. Cryogenic liquid cylinders intended for use with liquid nitrogen or liquid argon are likely to be completely unsuitable for containing liquid helium. Always check that the cryogenic liquid cylinder is clearly marked for use with helium before attempting to fill it with liquid helium. Follow all manufacturer’s instructions for the cylinder carefully to prevent ice obstructions and over-pressurization of the cylinder. Valve sequencing may be far more complex, even for routine operations, and is incredibly important, as demonstrated by the incident at ALS. In addition to being one of the coldest cryogenic liquids with a boiling point of only 20K, hydrogen is an extremely flammable material. Hydrogen gas is explosive in air from concentrations as low as 4% by volume. Even if an asphyxiation hazard does not exist from boil-off of hydrogen gas, the atmosphere around the source may still be flammable and/or explosive. The initiation energy for this reaction is also incredibly low, meaning that even a small spark, a static electricity discharge, or a nearby hot material may initiate a hydrogen gas fire or explosion. All equipment used for or near liquid hydrogen operations must therefore be electrically grounded and bonded to reduce the risk of explosion. A hydrogen leak which catches fire will produce a very pale blue, almost invisible flame which is easy to miss and personnel may unknowingly walk into or place a hand into a hydrogen flame. Because hydrogen is so flammable and readily explosive, extreme care must be taken so that it never comes into contact with air. Liquid hydrogen cylinders should never be used for other cryogenic liquids, and cylinders intended for other cryogenic liquids should never be used for liquid hydrogen. All lines used to transfer hydrogen gas or liquid must be thoroughly purged of air by evacuating the lines and backfilling with inert gas at least three times. Additionally, any pressure relief valves on a liquid hydrogen cylinder must be routed to minimize the risk of creating a flammable or explosive mixture with air. Transfer lines carrying liquid hydrogen are also prone to condensing air and forming oxygen enriched liquid or atmosphere, which only increases the risks of fire or explosion when working with liquid hydrogen. Vacuum insulated transfer lines are thus a necessity with liquid hydrogen. Unlike nitrogen and argon, which are denser as gases than air, hydrogen as a gas is far less dense than air. With liquid nitrogen and liquid argon, the largest concentrations of released cryogen will be close to the ground, especially in recessed areas. However, with liquid hydrogen the vented gas will accumulate at ceiling level, at the highest point. Hydrogen concentrations can be far greater in vaulted areas of the ceiling or in the open area above a drop ceiling, where room ventilation systems may not flush it out as effectively. These types of features pose a large asphyxiation and fire/explosion hazard. The inherent dangers of working with liquid hydrogen cannot be overstated. A thorough review by EHS personnel will be needed for any proposed work with cryogenic liquid hydrogen. Although oxygen is not flammable in itself, it is a strong oxidizer and can cause flammable and combustible materials to catch fire and burn. As discussed throughout this chapter, our atmosphere typically contains about 21% oxygen by volume. This is plenty of oxidizer to burn a wide range of flammable and combustible materials. Liquid oxygen is not only 100% oxygen by volume, but that oxygen is far more concentrated as a liquid than as a gas, since liquid oxygen expands by 860 times when allowed to warm to room temperature. A single drop of liquid oxygen has as many oxygen molecules, and thus as much oxidizing power, as approximately half a liter of air. It should not be surprising, then, that liquid oxygen is capable of causing fires in materials that aren’t normally considered flammable by the layperson, while materials which are known to burn in air will burn far more vigorously in atmospheres with increased oxygen concentration. Some materials may even ignite spontaneously on contact with liquid oxygen or high gaseous oxygen concentrations. Hair, clothing, oil, grease, kerosene, tar, asphalt, and many plastics and rubbers will all burn readily in oxygen rich environments. In particular, cloth and clothing can trap oxygen gas in the porous weave of the fibers and remain incredibly prone to ignition long after the source of oxygen has been removed. Clothing that has been exposed to liquid oxygen will burn incredibly hot and fast if ignited, and will ignite more easily. All sources of ignition and incompatible materials must be kept away from liquid oxygen operations. Vessels that contain liquid oxygen must be cleaned to very strict standards to ensure that no hydrocarbon or other incompatible contaminant is present. Oxidation of incompatible materials by liquid oxygen produces significant heat which causes the liquid oxygen to vaporize and expand quickly, potentially leading to the rupture of its container. The construction of a vessel to contain liquid oxygen must also avoid the use of any material which may oxidize or burn on contact with liquid oxygen. This makes liquid oxygen vessels unique in their construction. Liquid oxygen should never be added to any vessel of any type unless it is specifically constructed for use with LOx and has been cleaned according to strict protocols to ensure the complete removal of incompatible contamination. Unlike every other cryogenic liquid, LOx does not pose an asphyxiation risk. However, at high enough concentrations oxygen may damage the lungs, airways and eyes. A thorough review by EHS personnel will be required for any proposed work with cryogenic liquid oxygen. The intent of this section is to provide a quick way of assessing the potential for creating an oxygen deficient environment when using cryogens in indoor settings. Normal air contains nominally 20.9% oxygen. Cryogen, when released indoors in non-ventilated rooms, has the potential of displacing oxygen and thereby creating an oxygen deficient atmosphere (i.e., less than 19.5% oxygen by volume). While this section focuses on liquid nitrogen, these calculations can be applied to any cryogen by substituting the appropriate factor for the expansion of a volume of cryogenic liquid to gas upon warming to room temperature. A sampling of these factors can be found in Work Process A, Table A.1. The British Compressed Gases Association (BCGA) recommends that, for the purpose of risk assessment, the worst case possibility (iv) must be considered. And 24 converts from a loss rate per day to a loss rate per hour. In this case, the normal evaporation losses have an insignificant effect on the oxygen content of the room. However, where the increase in Nitrogen concentration, is 7% or higher, the resulting oxygen concentration will drop below 19.5%, and extra ventilation and/or oxygen monitoring will be required. A small room is used to house the filling station for other laboratories in the area. This room measures 10ft by 14ft by 10ft tall. A researcher wishes to fill a 34L storage dewar from the fill station. In this case, the oxygen level is very close to dipping below 19.5%. The researcher should consult their supervisor to determine if a full Oxygen Deficiency Hazard analysis should be conducted with the help of EHS. Again, 696 is the expansion factor for nitrogen from liquid to gas and dividing by 1000 accounts for the conversion from L to m3. We then use equation 0 to calculate the oxygen concentration in the room. This spillage would significantly deplete the oxygen concentration, leading to an extremely dangerous situation for the researcher. The researcher should contact their supervisor and obtain help from EHS to conduct an Oxygen Deficiency Hazard analysis on this microscope room before performing any work with cryogens there. This is the worst case that should be considered in the risk assessment—both (ii) and (iii) are taken into account. This calculation shows that even filling a 10L dewar in such a small space can be dangerous if the dewar were to spill during the filling operation. Arranging for any pressure-relief devices to vent to a safe place outside of the room. Installing mechanical ventilation possibly linked to the low-oxygen alarm. Requiring staff to wear personal oxygen monitors.